(0 Customer Reviews) | Write Review 4 issues per year Bride To Be is Australia's number one bridal magazine and 'your ultimate wedding guide'. Bride To Be offers you 300+ pages of inspiration and the most comprehensive wedding planning information in every issue. You'll get the hottest bridal fashion, jewellery, hair styles and beauty tips; the latest in wedding styling, DIY and reception trends; access to stunning real weddings; the best honeymoon escapes; plus gift registry and home ideas. Bride To Be brings you quality, style and the very best Australian and international wedding suppliers. Get planning your big day with our quarterly main issues (with over 300 pages of inspiration in each), or don't miss our five specialty magazines – ‘Your Day: The Best Real Weddings’, ‘Cakes and Wedding Food’, ‘Flowers and Wedding Styling’ and our ‘Wedding Planner’. Download the Bride To Be App today and start planning your perfect day! Happy Valentine's Day! 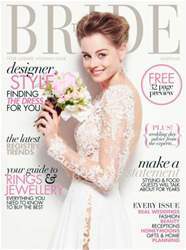 As our special gift to you, we're offering a free 32 page sample of our latest Bride To Be issue for your to download. With a little taste of what we offer in our full 334 page February-April 2014 issue. We love making Bride To Be magazine, and we're sure you'll love reading it. So, if you want more, then check out our special subscription offers in the app. And don't forget our special issues as well, including Your Day: The Best Real Weddings and our annual Wedding Planner. Bride To Be is Australia's number one bridal magazine and 'your ultimate wedding guide'. You'll receive 4 issues during a 1 year Bride To Be magazine subscription. You'll receive 4 issues during a 1 year Bride To Be magazine print subscription.